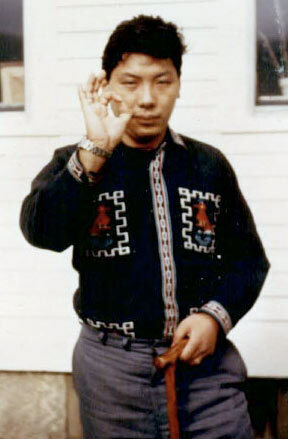 The founder of Shambhala was Chögyam Trungpa Rinpoche (1939-1987). Trungpa Rinpoche was the 11th descendent in the line of Trungpa tulkus, important teachers of the Kagyü lineage of Tibetan Buddhism. Renowned for its strong emphasis on meditation practice, the Kagyü lineage is one of the four main schools of Tibetan Buddhism. 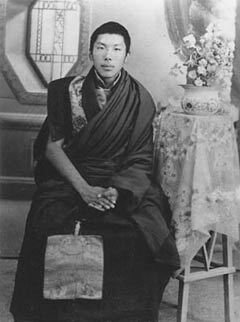 In addition to being a key teacher within the Kagyü lineage, Chögyam Trungpa Rinpoche was also trained in the Nyingma tradition, the oldest of the four schools, and was an adherent of the rimay or “non-sectarian” movement within Tibetan Buddhism. The rimay movement aspired to bring together and make available all the valuable teachings of the different schools, free of sectarian rivalry. 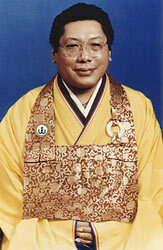 Throughout his life, Trungpa Rinpoche sought to bring the teachings he had received to the largest possible audience. After completing a rigorous monastic education, Trungpa Rinpoche was installed as the head of the Surmang monasteries in eastern Tibet. When the Chinese Communist party took control in 1959, Chögyam Trungpa Rinpoche was forced to flee the country. At the age of 20, he escaped his spiritual home, leading a small party of monks on horseback and on foot on the difficult journey over the Himalayas to India. In 1963, Chögyam Trungpa Rinpoche moved to England to study comparative religion, philosophy, and fine arts at Oxford University on a Spaulding Fellowship. During this time, he also studied Japanese flower arranging and received an instructors degree from the Sogetsu school of ikebana. In 1967, he moved to Scotland, where he founded the Samye Ling meditation centre, the first Tibetan Buddhist practice centre in the West. Shortly thereafter, a variety of experiences–including a car accident that left him partially paralyzed on the left side of his body–led Chögyam Trungpa Rinpoche to the decision to give up his monastic vows and work as a lay teacher. In 1969, he published Meditation in Action, the first of fourteen books on the spiritual path published during his lifetime. The following year represented another turning point in Trungpa’s life, when he married Diana Pybus and moved to the United States, where he established his first North American meditation centre, Tail of the Tiger (now known as Karmê-Chöling) in Barnet, Vermont. The ancient teachings and practical instructions that Chögyam Trungpa Rinpoche brought with him found an eager audience in the America of the 1970s, a decade during which he traveled nearly constantly throughout North America, published six books, and established three meditation centres and a contemplative university (Naropa University). He became renowned for his unique ability to present the essence of the highest Buddhist teachings in a form readily understandable to Western students. During this period, Trungpa Rinpoche conducted six Vajradhatu Seminaries, three-month residential programs at which he presented a vast body of Buddhist teachings in an atmosphere of intensive meditation practice. The seminaries helped train many of his students to become teachers themselves. Chögyam Trungpa Rinpoche also invited other teachers to come to the West and offer teachings, including His Holiness the Gyalwang Karmapa–head of the Kagyü lineage. Also during this period Trungpa Rinpoche founded Vajradhatu (headquartered in Boulder, Colorado), the umbrella organization for the many centres that were springing up throughout the world under his direction. In 1976, he appointed Thomas Rich to be his Vajra Regent, a traditional position giving someone the responsibility of carrying on the teaching legacy left by a teacher. Vajra Regent Ösel Tendzin was the first westerner to be acknowledged as a lineage holder in the Kagyü tradition. Late in the 1970s, Chögyam Trungpa Rinpoche expressed his long-held desire to present the path of meditation in secular terms. He developed a program called Shambhala Training, based on a legendary enlightened kingdom known as Shambhala. During the 1980s, while continuing teaching tours, Vajradhatu Seminaries, and book publication—and establishing a Buddhist monastery in Cape Breton, Nova Scotia, Canada—Trungpa increasingly turned his attention to the propagation of teachings that extended beyond the Buddhist canon. These activities included not only Shambhala Training, which was attracting thousands of students, but also Japanese archery, calligraphy, flower arranging, tea ceremony, health care, dance, theatre, and psychotherapy, among others. In planting the seeds for these many activities, Chögyam Trungpa Rinpoche sought to bring, in his words, “art to everyday life.” He founded the Nalanda Foundation in 1974 as an umbrella organization for these activities. During the 1980s, Vajradhatu grew to more than 100 city-based centres (Dharmadhatus) spread throughout the world, which offered meditation and teaching programs and several rural contemplative centres where intensive meditation and study programs were held. At these various centres, which formed a large and somewhat informal network, students were introduced to the possibility of integrating meditation practice and study into their everyday lives. Depending on their interests and inclinations, students engaged in any of the many contemplative activities that are now part of the Shambhala organization–from traditional meditation practice to flower arranging and dance. In 1986, Chögyam Trungpa Rinpoche moved to Nova Scotia, where hundreds of his students had settled. It would prove to be the last of his many moves. 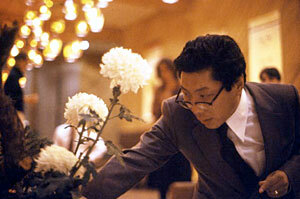 Not long after, in April 1987, Chögyam Trungpa Rinpoche’s life came to an end. His passing was marked in an elaborate day-long ceremony, attracting more than 3,000 people, held on the Vermont land where he had first established a foothold in the West. Several years later, the Vajra Regent passed away as well. During the period following these deaths, the community and its leadership turned for guidance to one of Chögyam Trungpa Rinpoche’s most revered and only living teachers, Dilgo Khyentse Rinpoche, then supreme head of the Nyingma lineage. In 1990, at the urging of Dilgo Khyentse Rinpoche, Chögyam Trungpa Rinpoche’s eldest son returned from a period of practice and study in Nepal to lead the community and direct the work Trungpa Rinpoche had begun. As the Shambhala lineage is passed from parent to child, Chögyam Trungpa Rinpoche had trained his eldest son, Sakyong Mipham Rinpoche (then known as the Sawang Ösel Rangdröl Mukpo), from childhood to take on this role. His first major directive as the Sawang was to bring the many activities of his father’s students throughout the world under the umbrella of Shambhala International and to call each meditation centre under his direction a “Shambhala Meditation Centre” offering spiritual training, meditation instruction, and cultural activities under one roof. In May 1995, with the organization in its twenty-fifth year, Shambhala Meditation Centres expanding throughout the world, and a well-established Nova Scotian community, the Sawang Ösel Rangdröl Mukpo was formally installed as Sakyong, leader of both the spiritual and secular aspects of Shambhala. At his enthronement as the Sakyong, he was also recognized by Penor Rinpoche–then supreme head of the Nyingma lineage–as the reincarnation of Ju Mipham, a revered nineteenth-century Tibetan meditation master and scholar. This ceremony marked an important milestone in the history of Shambhala, confirming the role of Sakyong Mipham Rinpoche in carrying on what his father envisioned when he set foot on North American soil twenty five years earlier. One of the greatest accomplishments of the Vidyadhara, Chögyam Trungpa Rinpoche was the establishment of the Shambhala mandala, a global basis for the transmission of the vision, teachings and practices he brought to the world. The teachings and transmissions passed on by the Vidyadhara are studied and explored in the expanding association of centres, groups and other entities he founded and which are now directed by his son and spiritual heir, Sakyong Mipham Rinpoche. In addition to centres and groups on five continents, the Shambhala mandala includes a range of other programs and institutions, reaching out into education, health care, social work, organizational change and innovation, publishing, and a broad spectrum of the arts. Founded by Chögyam Trungpa Rinpoche in 1974, Naropa is the first of its kind as a Buddhist-inspired university in North America that integrates ancient traditions of wisdom into the curriculum of modern education. Since its inception, Naropa has been dedicated to contemplative education in which awareness of thought processes, sense perceptions and emotions are integrated into the study of specific disciplines. The Shambhala Archives is dedicated to preserving original records pertaining to the life and teachings of Chögyam Trungpa Rinpoche, Sakyong Mipham Rinpoche and other prominent Tibetan Buddhist teachers. It is a repository and resource for transcripts and audio-visual collections of Buddhist teachings. Currently, an Audio Recover Project is underway that will remaster and preserve in perpetuity more than 1,500 recordings of talks given by Chögyam Trungpa Rinpoche. In The Collected Works of Chögyam Trungpa, Shambhala Publications brings together in eight volumes the writings of one of the first and most influential and inspirational Tibetan teachers to present Buddhism in the West. Organized by theme, the collection includes full-length books as well as articles, seminar transcripts, poems, plays, and interviews, many of which have never before been available in book form. From memoirs of his escape from Chinese-occupied Tibet to insightful discussions of psychology, mind, and meditation; from original verse and calligraphy to the esoteric lore of tantric Buddhism. The impressive range of Trungpa’s vision, talents, and teachings is showcased in this landmark series. Since 2001, the Nalanda Translation Committee has been dedicated to the preservation and translation of early writings by Chögyam Trungpa Rinpoche. Chögyam Trungpa Rinpoche’s nephew, Karma Senge, spent fifteen years searching out and compiling the writings composed by Chögyam Trungpa Rinpoche before his escape from Tibet. The collection totals about 400 pages and spans diverse topics, including liturgies, songs, and practical advice. The Konchok Foundation is dedicated to preserving the unique spiritual tradition of Surmang Dutsitil, the home monastery of Chögyam Trungpa Rinpoche in eastern Tibet. Initial efforts are focused on supporting the education of the 12th Trungpa Tulku (the successor to Chögyam Trungpa Rinpoche at Surmang) and to rebuilding a shedra, or monastic college, there. The medical needs of the local community are being addressed by a sister organization, the Surmang Foundation. The Shambhala teachings, first revealed by Chögyam Trungpa Rinpoche in 1976, are being actively propagated through Shambhala Training and the teachings of his spiritual heir Sakyong Mipham Rinpoche. Terma or “treasure” texts are dense kernels of wisdom that often require oral explanation and elaboration into a complete path of meditation. In the case of the Shambhala terma, the Sakyong arranged and bestowed the first Rigden Abhisheka in the summer of 2005 as a prerequisite to advanced practices related to the Shambhala teachings as originally revealed by Chögyam Trungpa Rinpoche. Click here for more information about the terma of Chögyam Trungpa. Dramatically transforming the landscape of Shambhala Mountain Center, The Great Stupa of Dharmakaya is an expression of the aspiration for peace, harmony and equanimity for all beings and the largest and most elaborate example of Buddhist sacred architecture in North America. Since its consecration in 2001, the Great Stupa has attracted thousands of visitors a year from all over the world. Click here for more information about the Great Stupa of Dharmakaya. The Chronicle Project is a repository for a rich array of stories, interviews, travelogs, and features about the founder of Shambhala, Chögyam Trungpa, Rinpoche and his legacy. Its goal is to tell the story of his life in a detailed year-by-year account, to gather the oral history from those who knew him, and to preserve a record of his extraordinary legacy for future generations. The Chögyam Trungpa Legacy Project is dedicated to preserving and promoting the dharma legacy of Chögyam Trungpa Rinpoche through the preservation, propagation and publication of his dharma teachings. The Legacy Project also plans to initiate new projects and programming, to create a comprehensive virtual archive and learning community, and to create the financial base for current and future generations to support this mission. Through this process, the Legacy Project will enhance, enrich, and further inspire existing institutions and other manifestations of the Shambhala world that Chögyam Trungpa Rinpoche created.